Yeti, located at the Second Station of Mt. 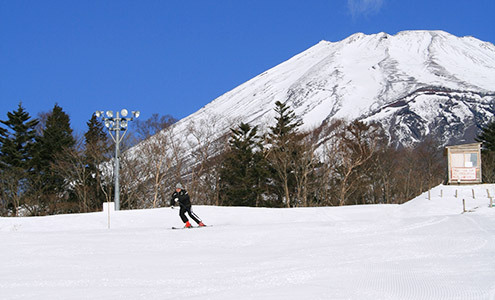 Fuji, is the place to enjoy winter activities. Visitors must purchase an admission ticket to use the facilities*. The courses are laid out in a unique way sloping down from the Center House, so once you finish warming up you can hit the slopes without having to ride a lift! 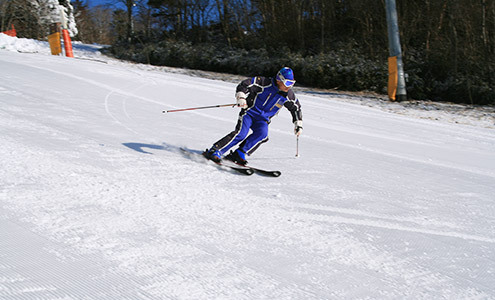 Of course, skis and snowboards can be used on all courses. *What is an admission ticket? Yeti is a snow paradise where paying admission gains you access for a whole day without needing lift tickets. The admission ticket will be collected at the gate when you leave, so make sure not to lose it. 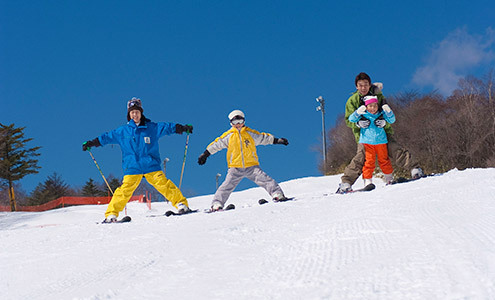 * To ensure safe skiing and snowboarding, plastic skis for children (without boots) are only allowed on the playing grounds. 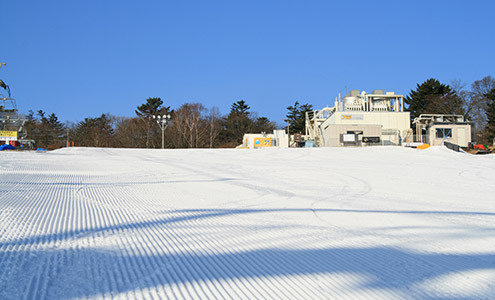 Snowdecks and other equipment not utilizing bindings are prohibited. * Please refrain from sitting down on the slopes for the safety of yourself and others. This can cause accidental contact or collisions. * To prevent theft, one person may only bring one set of skies or one snowboard on the slopes. 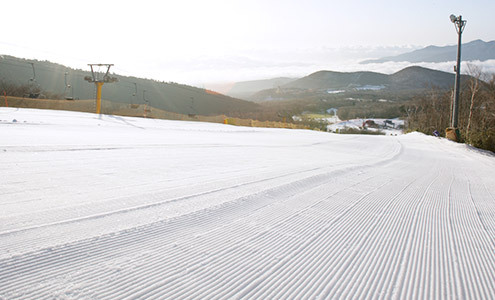 This slope, Yeti’s main course, is perfect for the first run of the season! It is the first to be opened in October of each year and can be enjoyed throughout the entire season. Slope A has a total length of roughly one kilometer and a height difference of approximately 150 meters. 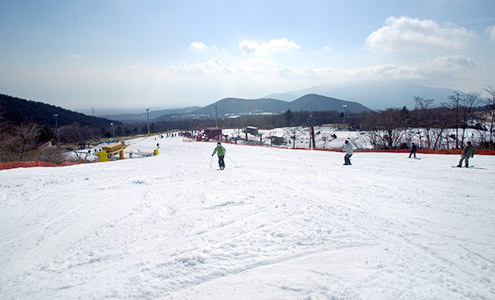 This slope is for both beginning and intermediate skiers and snowboarders. The gentle top part of the course has a magic carpet and high-speed quad (for four people). In this way, visitors can enjoy this course with peace of mind according to their own skill level. The top part of this course is a scenic spot that’s perfect for taking photographs, including views of Mt. Fuji and Suruga Bay on clear days! Slope B is for beginning and intermediate skiers and snowboarders. The top part has a magic carpet and a gentle incline that’s ideal for lessons. 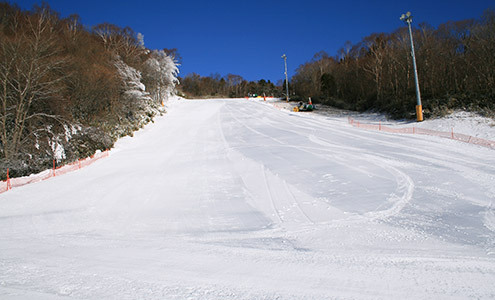 The central part and below is a wide course with many undulations, allowing you to enjoy dynamic skiing. 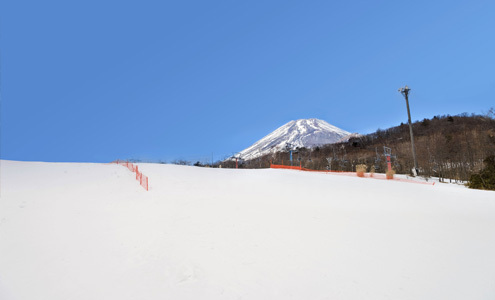 This slope is for intermediate and advanced skiers and snowboarders. Until the middle part it has some steeply sloped areas and a great deal of variation. The Level 1 badge test is also conducted here, so this slope is ideal for skiers and snowboarders that want to improve their skills. * Closed during all-night skiing. 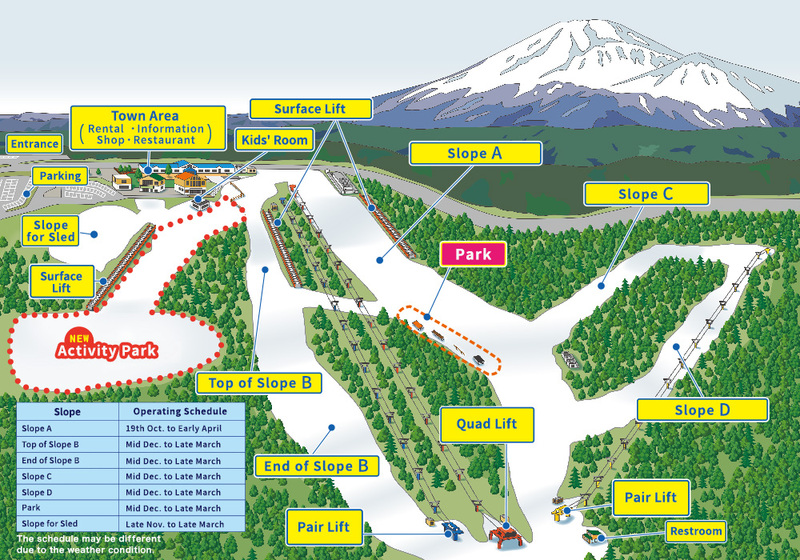 This course, the most challenging at Yeti, is for intermediate and advanced skiers and snowboarders. It has an average angle of 16 degrees and maximum angle of 25 degrees, making it a very difficult yet fun course that requires strategy.